Cao County Yuguang Crafts Co., Ltd. covers an area of 4,000 square meters and is located in the beautiful hometown of peony - Heze City, Shandong Province. Our factory has building offices, show rooms, production workshops, coating and drying rooms and other facilities. With over 120 working staff members, our turnover is around RMB50 million. All products are exported to America, Japan and European countries. We are a professional manufacturer of handmade arts and crafts. 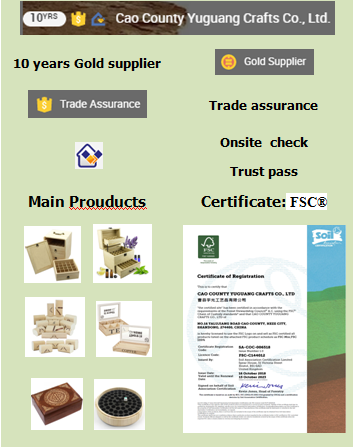 Our main products are wood products, willow products and straw products including bed slats, wood cabinets with willow or straw drawers, picture frames, wood boxes for gifts, wine boxes, candle holders, bird house, weaving products, willow baskets, willow laundry baskets, willow furniture, straw baskets, grass basket and other related products. We have the ability to meet the requirements of different customers to make the products according to the customers' designs and to make our own products. At present, we invest more in the R&D to develop all kinds of new products and they are very popular among customers. Our operational principle is "Human resources are the first priority, innovative spirits, and pursuing excellence". With strong technical advantage, rich resources, on time delivery, reliable quality control and competitive prices, we gain a high reputation among our customers. We would like to cooperate with you and create the market in the future together, thus we can both benefit and achieve great success in the arts and crafts industry.